In this post, I explain why an entrepreneur should spend up to 20% of his valuable time working on related projects that are not essential compared to its short-term goals. To increase the dissemination of ideas, the famous TED Conference has created a program called TEDx. TEDx promotes events organized independently at the local level, to get people to share a similar experience to that of TED. Today, TEDx HEC Montreal published the presentation my ex-wife Nathalie Provost did during this local event. She explained 23 years later, how she recovered from the massacre that happened in 1989 when she was student at the École Polytechnique. Nathalie was shot by Marc Lépine after he entered a classroom and separated the men and women. She courageously tried to reason with the gunman but took four bullets anyway. Despite the Polytechnique, Nathalie profoundly love life and profoundly love mankind. She have faith in humanity despite everything. And during this presentation, she offer people a little hope, all the better: You can overcome difficult things, personally and as a group also. In another vein, much more rational and less emotional, while taking a look at the other presentations, I discover a great talk by Louis-Philippe Maurice. “The difference that 20% of your time can make”. Since a very young age, I have always spent nearly 20% of my time working on related projects not essential compared to my short-term goals. Often letting myself be guided only by my curiosity and my passions. I think the 20% rule is fundamental to remain a free thinker. Too often, we believe that the key to reach success for a startup is to keep the focus. I think the key is to remain open for extension but closed for modification of the fundamentals. This is the “Open Close Principle” applied for startup. The fulfillment of the startup mission should be done in a way that new customers should be acquired only with minimum changes regarding the values ​​of the founders. The goal is not to add complexity but rather to eliminate what is superfluous. To do this we must give ourselves the freedom to explore. It is by spending time on what seems not important that we free our mind. Categories: Lean Startup | Tags: Entrepreneur, Mission, Slingboards Lab, value proposition | Permalink. Why Slingboards will be an hybrid app? In this post, I explain why at Slingboards Lab (my new venture), we have decided to build an hybrid mobile app instead of a native or HTML5 app. I said in the past and I will say it again: the tablet is a completely different platform than the PC and in this sense it has its own natural structure for UX experiences. Each space has a natural structure, which is an organizing principle that helps people form a mental model of how they think about and navigate that space. Rooms are the structure of homes, neighborhoods and streets are fixed structure of cities, aisles are the structure for most stores, and Web pages are the structure for Web sites. The natural structure for the PC experience was the desktop and accompanying folder/ file system. Influenced by notions of containment and place, this structure allowed people to traverse their personal file systems with ease. Within the PC platform, applications are often relegated to the role of a secondary actor. Files are the stars of the desktop experience, whereas applications are merely the tools that make files. In contrast, within the tablet platform, applications are the star, making them a natural structure for mobile experiences. In fact, we can summarize the tablet experience as a list of “native” apps. Disappointing by its simplicity, this minimalist approach has proven effective. 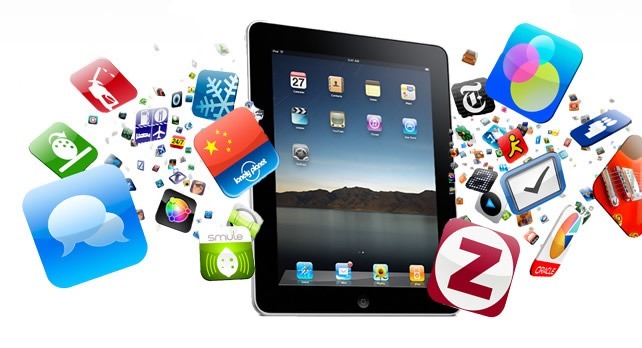 Tablet application marketplaces also reinforce the app as the natural structure for mobile experiences. A tablet platform’s value and popularity are largely attributed to the depth and breadth of its App Store portfolio. Nowadays, the main challenge for organizations is to develop mobile applications. However, we no longer control the mobile platform in use. Tablets are provided by individuals according to their personal preferences. Some will bring Apple IOS devices such as the iPad while other will arrive with Microsoft windows 8 tablets or with Google Androids tablets such as the Amazon Fire. This diversification of mobile devices would not be a handicap if there was a single programming model to build native apps. Unfortunately, this is not the case. Native apps are specific to a given mobile platform and are built using the development tools and language that the respective platform supports (e.g., Xcode and Objective-C with Apple iOS, Eclipse and Java with Google Android). So, if you are a young startup like Slingboards-Lab, should you go native, HTML5 or hybrid? Faced with this fundamental issue, I must acquiesce with Stephen Forte: A startup should never, ever, go native. The very nature of a startup is that you have little money and need to be super fast on the market to validate your assumptions (and discover that you’re wrong). On the other hand, because the apps are the natural structure for mobile experience, I think opting for an HTML5 app is a mistake. So there is only one logical choice; the hybrid app. This thinking explains why we have chosen to build Slingboards as an hybrid app. We are working hard and soon we will be able to share with you the results of our discovery. Stay tune. Categories: Lean Startup | Tags: Hybrid apps, Mobile, Slingboard, Tablet | Permalink. My book Executable Specifications with Scrum will be officially release by the end of July. These days with my publisher Addison Wesley, we are finalizing the last copyediting tasks. For those who can not wait for the final version, in the meantime, if you are a subscriber of Safari Books Online Service, a “rough cuts” version of my book is available here. Happy reading. Categories: Announcements | Tags: Book, Executable Specifications, Scrum | Permalink. In less than 3 years, tablet’s sales passed notebooks and PCs in Q4, 2012. In this post, I highlight what I think are the consequences for the enterprises of such a fast adoption rate by consumers. One of my favorite sources of information about the tablet ecosystem is the TabTimes portal. I find in there not only the latest news but also very interesting analysis about tablets adoption by the enterprise. For those of you who speak French and want to learn more about this portal, in February, as part of my Visual Studio Talk Show podcast, I did an interview with Patrick Pierra, the founder of TabTimes (which by the way is a French-Canadian like me). Recently, I read a summary of Kleiner Perkins analyst Mary Meeker. She highlights a big surprise about adoption rate of tablets. In less than 3 years, tablet’s sales passed notebooks and PCs in Q4, 2012. With such a fast adoption rate by consumers, it is inevitable that tablets will make their appearance in the enterprises. This is already happening. The following quote, well known by Star Trek fans, applies perfectly to the modern reality of IT in the enterprise. We are convinced that not only consumers will use their tablets at work, but a new line of business-centric applications targeting tablets will emerge shortly. Slingboards are a clear example of this new type of applications. We are happy to be a player in this new era. Follow us and we’ll have fun. Categories: Lean Startup | Tags: Slingboard, Tablet | Permalink.